"This production .. propelled by an energetic cadre of actors including Elise Arsenault, Michael Hisamoto, Rory Lambert-Wright, Jeff Marcus and Hayley Spivey. Arsenault, on cello, also accompanies the play with live music." 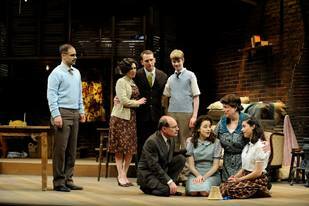 "The cast is phenomenal as a whole, but several members really set themselves apart. Actors Elise Arsenault and Jeff Blanchette consistently steal the show when on stage together. The pair play Nicky (Rod’s roommate) and Trekkie Monster together, with Blanchette voicing and operating the mouth and left hand of the puppets while Arsenault operates the right hand. What is most impressive is the level of synchronization these two have in their combined roles while gesturing, moving around stage, and dancing. These two also play the Bad Idea Bears, who are easily the funniest characters in this show." 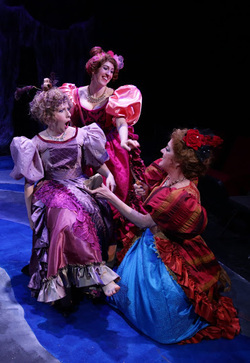 "With great flair and purposeful awkward sauciness, Cinderella’s wicked Stepmother (Maureen Keiller) and her mean stepsisters Christina English) and Elise Arsenault seemed to be having the most fun during the show. " "Maureen Keller as Cinderella's stepmother, Christina Englishas Florinda and Elise Arsenault as Lucinda are the perfect Trifecta of domestic terror." "Elise Arsenault plays [Mrs. Van Daan] with flair and fire, making the most of her often nasty nature and petty attitude with her penchant for things over people." An Article Featuring Elise in EastBayRI: "Bristol Native Featured in 'Diary of Anne Frank'"
"As Mrs. Van Daan, Elise Arsenault is the perfect picture of frayed nerves and emotional tumult." "[Elise Arsenault] is great as the woman obsessed with her possessions and status."